Description: A CSX Cw60AC departs Hamlet Yard at dusk. Description: SU156 with two AC60CW's on the point roars through ZINC on a beautiful summer afternoon. Description: CSX K207 meets the Q174 at CP Vine with both crews having a short but lively conversation. The picture before this one was actually taken after this one(sorry!). Description: Westbound trailer train just through the signals at Palmyra, NY. Description: V373 approaches the signal at Big John's. The rear of the train is coming around a horseshoe curve which takes the tracks over NC Highway 221. The tracks are on both sides of NC221 at this point as they climb from Sevier toward Rocky, Camp Two, and Altapass. Description: This CSX coal train is parked for the weekend at Burnsville. Description: Hollow Road, 1241 hours. 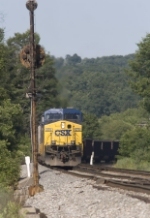 Description: CSX 670 powers an empty grain train north to Flint.